Research can be hard. That’s okay. Joe Hardenbrook has written a great post on the issue of making (re)search exciting or fun, which you should all read. It drives home some opinions that I bet a lot of us share, mainly being that research isn’t necessarily exciting. And that any “excitement potential” held in a research project is dependent more on the subject matter and the researcher than it is in any tool at hand. Kudos to Joe for speaking plainly and truthfully on this subject. I’m not a killjoy at work, and I promise that Steeleworthy’s Office Hours is not all doom and gloom, but neither am I some one who is going to pretend that research is something it’s not. Research is work. Research can be frustrating. Even for the best researchers on the planet, research can be difficult. The advice and consultation I give can definitely help researchers of all kinds (students, faculty, staff, community members, etc) make their research more efficient by systematizing their work and improving their search precision, and this will make their work easier had they not spoken to me first. If our researcher’s excitement or interest is piqued in the research process – if they found cheap thrills as librarians and archivists do when they’ve found the needle in the haystack – then I’m thrilled and I know I’ve done my job. But “excitement” should not be our primary measure here. Our main purpose (our main duty) is to collect the best of the world’s information, master its systems, and then help others access this information and master the systems themselves. What it comes down to for me is how we present ourselves and our work to our users. Our users don’t expect us to be fun-makers. Our users come to us because they need help finding stuff. If we can put a smile on their face along the way, then we’re doing them a service, but only if we’ve helped them find that information in the first place. We’re here to help people master research. In many ways, the library is where the job gets done at university. I really do hope that everyone enjoys their work, whatever their work is. And I also hope that everyone enjoys the classes they are enrolled in and the assignments they are working on. But those assignments are still work, and I don’t want to play down the effort required to get the job done. I have an excellent demeanour with my users and I’m confident that many of them see me as a team player who will help them through their research. But I won’t lie to them. I’m not going to say that some one is going to have a blast writing an essay when really they just want to have watched last night’s season premiere of Revenge. Instead, I speak honestly to my users. “Is this going to be work?” Yes, probably. “Is it going to take some time?” Yes, likely. “Is it going to be the worst thing to ever happen in my life?” Not at all. “Are there tools and techniques I can use to make my work more efficient?” Yes, definitely. “Can you help me?” Yes, obviously. I am already. I’m stating the obvious by telling you that September is a busy month in academics. The start of the school calendar changes the mood, tempo, and pulse of a university campus, and it shifts things at the library into full gear as we roll out all programming and services. Here are a few of the things I’ve been contributing to lately, which has kept me busy in a good way (as opposed to the bad kind of busy). I’ve taken on liaison duties in Sociology and Social Work while a colleague is on sabbatical this year, and I’m also part of a group that is expanding the Library’s services to the University’s students who are cross-registered at the Balsillie School of International Affairs. This has already translated to a large increase in my in-class instruction, especially for Social Work, which is its own Faculty and has its own small library. Taking on these subject-based duties has been a great opportunity since they’ve given me greater everyday contact with faculty and researchers whose work touches on socio-economic data or would benefit from research data management support and consultation. Simply put, it’s a lot easier to push data management planning when you already have a built-in relationship with the researcher, so I expect my subject-based work in Sociology and Social Work to benefit our RDM programme. Don’t think that this project or the next (RDM) are subordinated to the others I’ve mentioned because they’re at the bottom of this list. That’s far from the truth as both areas have seen significant change in the past few months. On the Data and Stats side alone, data librarians in Canada are busy dealing with a new EULA for Canada Post postal code products (e.g., the PCCF) and what it means for researcher access and use. This issue alone has eaten up probably half of my time in the past two weeks since the new EULA changes long-standing practices for researchers who use these products, and the library, which administers licences on their behalf. A lot of time has been given to consultation within the data community and within the library to produce new practices, and I’m now rolling out a PR and education campaign. If you are Laurier faculty and use postal code products, be on the look out for more news on this very shortly. If you’re faculty at another university in Canada, you may want to contact your own data librarian. 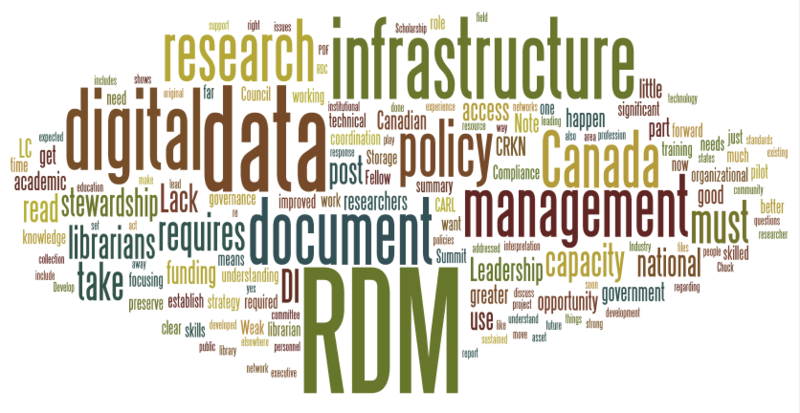 RDM has been the largest part of my work at Laurier. We’ve been developing a research data management programme, based largely on consultative support that helps researchers and research groups learn about and then develop flexible data management plans that speak to their current and future research needs. Next month, I’ll be attending CASRAI’s ReConnect2013 conference to build upon my current knowledge and to see and learn what others are doing in this area across Canada and in other jurisdictions. We have a couple of RDM projects on the go already, and I would like to increase that number on campus since the service the Library provides offers clear benefits to the researchers in terms of meeting funding obligations, providing research management planning, and improving access to and citation of produced work after the research has ended. Laurier researchers: let’s chat. The Laurier Library is searching for great candidates for another limited term posting. We have a 1-year, limited term part-time appointment for a Business and Economics Librarian at our Waterloo campus. Working with our other Business and Economics Librarian, the person who takes on this position will hit the ground running and be quite busy interacting with the School of Business and Economics – the largest faculty at Wilfrid Laurier University. I promise that this would be an incredible learning opportunity for new or recent grads, and also a chance to gain and build upon your existing experience with business and economics librarianship. Business and Economics students at Laurier work with stats and data quite a bit, so I expect to collaborate often with who ever fills this position. I’m happy to answer any general questions you might have about the posting, the university, and living in Waterloo, Ontario. See our Business Librarian posting here. The application deadline is August 5, so start moving on this one soon. Here’s my opportunity to influence all of your summer reading lists. The article that I co–authored with my colleague, Pauline Dewan, Incorporating Online Instruction in Academic Libraries: Getting Ahead of the Curve, has just been published in the Journal of Library & Information Services in Distance Learning. This (with other reports, presentations, and articles), is the culmination of a large project Pauline and I undertook to assess our Library’s online teaching and learning programme in 2012. During the course of that project, we conducted a thorough literature review and analysis of the state of online instruction in our library, and generally in North America. The recommendations we made regarding goal formation, acquiring stakeholder buy-in, technological formats and delivery, and organizational change, can speak well to many libraries’ online teaching and learning programmes. We also have an extensive bibliography that touches on policy, analysis, information literacy, and organizational behaviour – check this out because we’ve done a lot of heavy lifting, which may you help you in your own work. The Laurier Library is seeking out great candidates for our open limited-term, part-time Science Librarian posting. Click here for details. I’m certain that the person who takes on this file will get a lot of classroom/instruction time and will see many research consultations – you’ll be busy, but it will be a Good Busy. The Library is accepting applications until July 22, 2013, so act fast! Laurier Librarians Getting the Job Done.